Professional Upholstery and Sofa in Havering. The prices are fixed, affordable, without any hidden fees. Stain removal is included. Call 020 3746 0000 or contact our operators online non-stop to get a non-binding and free price offer right away. The steam cleaning is completed with a strong water extraction machine. The sofa or other furniture is shampooed and then rinsed off. During the process, 95% of the water used is extracted, so drying is not as long. On request, our cleaners can use air moving equipment to speed up the drying process. We can also offer you to deodorise or Scotchgard your sofa or other piece of upholstered furniture. Thomsons Cleaning Havering RM experts have specialised cleaning options for leather upholstery. We also can repair small flakes and cracks with our special leather fillers. Our technicians will repair, clean and condition your favorite leather sofa, so that future cracking of dried leather is prevented. Waste no more time - choose our professional upholstery and sofa cleaning services today! Our Havering RM cleaners does a thorough inspection, to determine the exact material of the sofa or upholstery, as well as the stains which can be removed. The couch or other upholstered furniture is carefully hoovered with a professional, powerful vacuum cleaner to get as much debris, dust and residue out of it. Then the heavily soiled areas and the stains are pre-treated with the appropriate Prochem certified solutions. Before using any solutions, the cleaner will perform a test on a hidden small spot of the sofa just in case. After this pre-treatment, the cleaning specialist proceeds to deep clean the sofa or other piece of furniture. 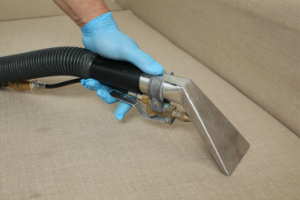 Deep cleaning can be dry or steam, depending on your request, as well as on the type and condition of the upholstery. For more delicate settees and furniture, dry cleaning is used. The option is sprayed on the entire upholstery and left to sit. After it is dry, it is hoovered off of the furniture, and along with it all of the dirt from the sofa or armchair. Thomsons Cleaning has been professionally deep cleaning upholstery and sofas of the commercial and domestic residents of Havering RM since 2004. We hire only thoroughly vetted and reliable cleaning technicians. We train them and constantly monitor and assess them for compliance to our rules and regulations for safety and quality. The cleaners are equipped and experienced with the top cleaning tools and solutions to clean all types of upholstery. Stain removal is included in our fixed price for the deep cleaning. Booking a expert cleaning service in Havering RM has never been quicker or easier. All you need to do is pick up the phone and call 020 3746 0000, or fill out the online booking request and click send. Our customer service operators are there for you non-stop. Your request will be processed in up to two hours, after which you will be sent written confirmation via e-mail and text message. You do not need to pay any advance payment for booking our upholstery and sofa cleaning service. Our prices are fixed, with no hidden charges. You can get a special offer, if you order more than one of the services we offer at the same time. Estate agencies, regular customers, landlords , and people who book early on get preferential prices. Book now - we are available 365 days a year!